I have one folder on my computer that I save all web downloads to; this happens regardless of file type, size or purpose. Many of the files are only temporary downloads, for instance setup files of applications that I test, demonstration videos that I watch once or documents that I want to read. Some files on the other hand are there to stay, and I used to move them out of the download folder manually in the past to preserve them while I deleted the temporary downloads. I usually waited until the folder "felt" like it was overcrowding with files before I used the next hour or so to move all the files that I wanted out of the file. Then I discovered Digital Janitor and it changed a lot, for me. The free program can sort files and move files automatically based on rules that you define. It begins with the selection of a root folder. Only files in that folder are included when Digital Janitor processes files on the system. You can include sub-directories automatically in the processing or restrict the processing to the root folder and the files it contains instead. Files can be sorted by a combination of three rules: Extension, Keyword and Size. It is for instance possible to add a rule to move all mp3 files to the mp3 collection folder on another hard drive, files with the word SEO to the Internet Marketing folder, or all files larger than 20 Megabytes to the hard drive with the largest amount of free space. Multiple rules can be combined, and destination directories can be configured for each rule individually. You could move all mp4 videos that are larger than 5 Megabytes to a folder, and all mp4 videos smaller than 5 Megabytes to another. A click on Sort starts the processing of the selected folder. All matching files are processed by the application and either moved or deleted automatically. Deleted? 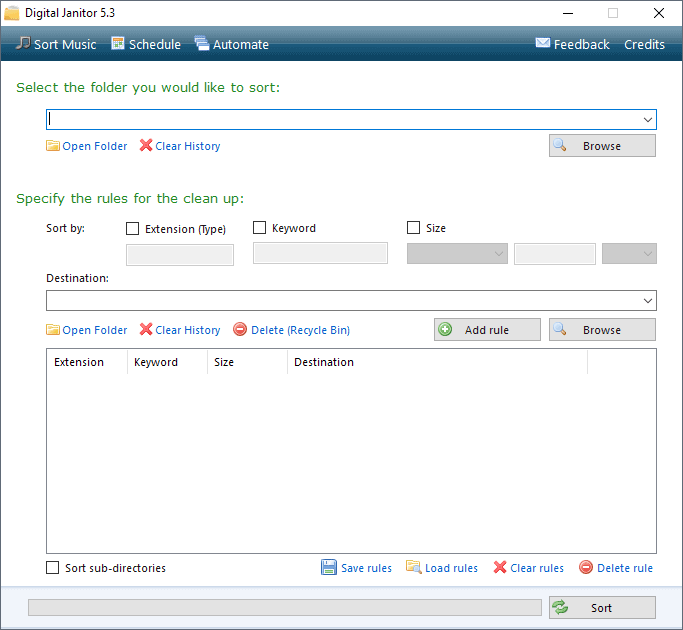 Digital Janitor has a special option to delete files instead of moving them to a new destination. This can be configured by clicking on Delete (Recycle Bin) after a file rule has been added. Another interesting option is the ability to save rules to load them again at a later time. It speeds up the process of moving and deleting files from select directories. Digital Janitor makes it even more comfortable by offering scheduling and automation options. 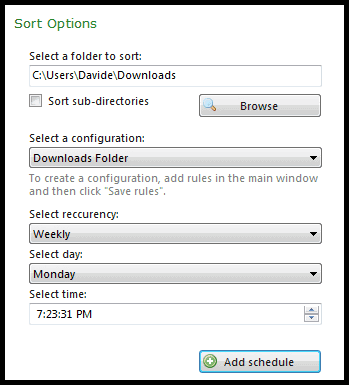 The Scheduler offers to run saved configurations regularly which would fully automate the process. Automate on the other hand is a dumped down version of the tool that requires less input. You basically select the folder that you want to sort, the destination folder and one of the available automation options. Available for selection are to group files by name, extension or type with the option to configure types separately. A type consists of one or multiple file extensions. This is for instance helpful to move all music files or documents, regardless of their extension, to a specific directory. Digital Janitor has one final option. It offers to sort downloaded music by tags. It can sort by artist or album, and rename files to the song title. While that may not be as sophisticated as Mp3 Folder Structure Maker it certainly can aid the user in moving and organizing music files effortlessly. Digital Janitor is available at the developer homepage. The program ran fie on a 64-bit Windows 7 test system. It is compatible with all Windows versions from Windows XP to Windows 10, and requires the Microsoft .NET Framework 2.0. Thanks for bringing this program to my attention! I have a rather large collection of music, and I’m sure there are copies of copies throughout the folder. I’ve tried using Belvedere to sort through it to no avail, but this worked very well!